Great patients are the key to all successful practices, and we would like more patients just like you! When you come in for a visit, we will give you a few referral cards to keep in your wallet in case you come across someone that we might be able to help. Simply write your name on the front, and hand the card to the person you are referring. This way, when they come in for their visit, we know who to thank! The new patient will receive a complimentary comprehensive evaluation ($81.00 value), and you will receive a $50.00 credit on your account to use toward any future services or products we sell in the office! 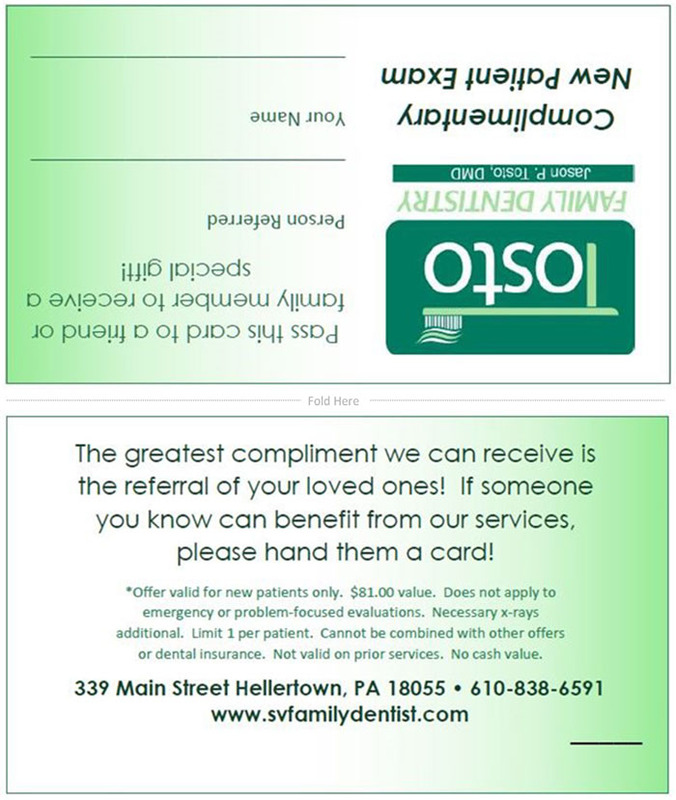 If you do not have a referral card handy, you may click the link to print one or complete the form below! ** Referral card must be present to receive offer/credit. Valid for new patients only. New patient must be referred by existing patient to receive complimentary exam. This offer does not apply to emergency or problem-focused evaluations. Necessary X-rays additional. Limit one card per patient. Limit one $50.00 referral credit per family. Cannot be combined with other offers or dental insurance. Not valid on prior services. No cash value.